Sunday 8. Took breakfast at a German Hotel after which I took a walk about town. Do not feel well today, am very much effected with a cold. Our division occupies eleven boats. We left our moorings at ten o’clock P.M., our destination is reported to be up the Tennessee river, to a place called Florence. The weather is good and I hope it will continue so until we reach the point assigned us for debarkation. Monday 9. 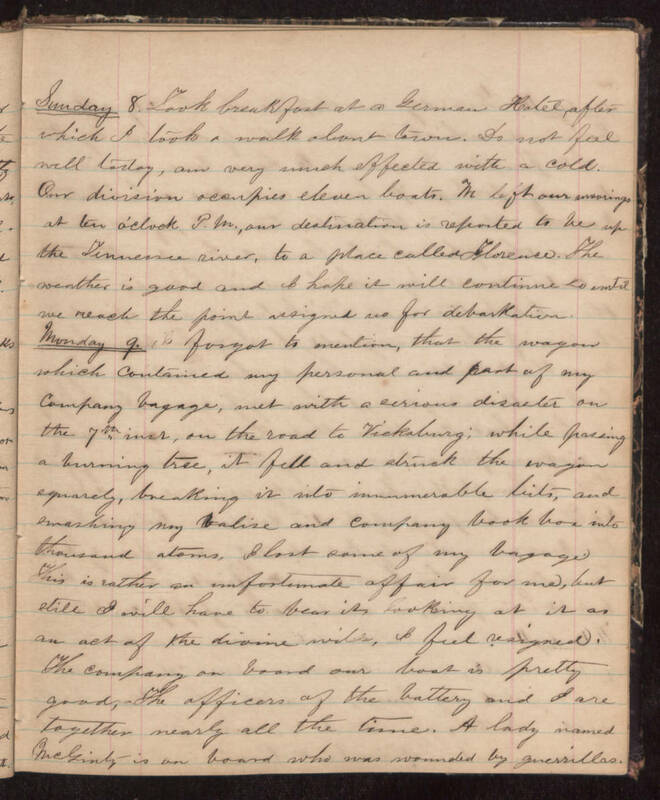 I forgot to mention, that the wagon which contained my personal and part of my company bagage, met with a serious disaster on the 7th inst., on the road to Vicksburg; while passing a burning tree, it fell and struck the wagon squarely, breaking it into innumerable bits, and smashing my valise and company book box into thousand atoms. I lost some of my bagage. This is rather an unfortunate affair for me, but still I will have to bear it, looking at it as an act of the divine will, I feel resigned. The company on board our boat is pretty good. The officers of the battery and I are together nearly all the time. A lady named McGinty is on board who was wounded by guerrillas.